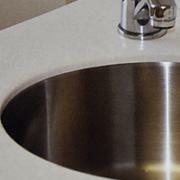 When you're shopping for Custom Laminate countertops, you have several choices when it comes to sinks. The following are some options that CVCT can sell to you directly, but we can also use almost any sink you choose. Look here to see some of your options. This is the traditional style, where the sink is mounted from the top of the counter into the sink hole. 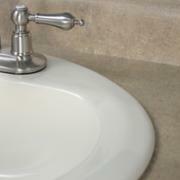 Top-mount sinks are the most economical choice and come in various materials and sizes. Click here to see samples and come by our showroom to view them in person. Very clean looking, and easy to maintain, this style features a smooth seam between the counter and the sink without any lip. Check out your choices here and see them in our showroom as well.